Mee Siam is a popular rice vermicelli noodle dish in Malaysia and Singapore. It is a nice breakfast or tea break food. It is a common dish you can find during events and gathering too. There are “dry” and “gravy” versions, both are spicy and a little bit sour. 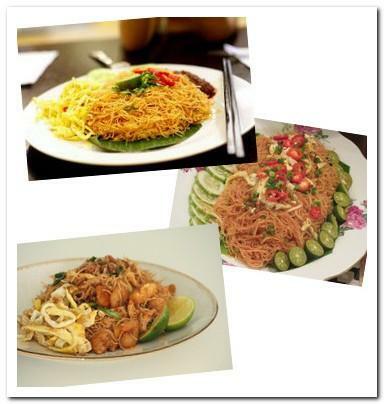 Dry version mee siam is simply fried rice noodles and gravy version served with light gravy. The preparation and cooking are a bit tedious, but it's worth it for the deliciousness and also nothing too difficult. Just need patience and time. Grind all paste ingredients in a blender until come to a smooth paste. Heat cooking oil in a pan, turn to medium low heat, add the paste, keep stirring and cook until fragrant. Paste color will turn darken and oil separates. Be patient, it's taking time. Add lime juice and brown sugar, stir until sugar is dissolved. Add fish cake, tofu. Stir and cook for 2 - 3 minutes. Add in rice vermicelli, toss until the noodles well coated with the paste and soften. Add bean sprouts, stir and toss for 3 - 5 minutes until everything mix nicely and vegetables are cooked. Taste, add more fish sauce if needed. Top with omelet, garnish with coriander and serve.